Regina, SK – Every championship-calibre team requires a championship-calibre leader. 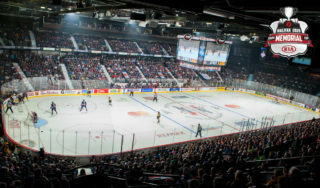 Regardless of which team skates away with the 100th Mastercard Memorial Cup crown on Sunday, the Acadie-Bathurst Titan and host Regina Pats have arrived at this championship stage thanks, largely in part, to outstanding leadership. When the final buzzer sounds, it could very easily be argued that both Jeffrey Truchon-Viel and Sam Steel put forth MVP-calibre tournaments. Viel, captain of the Titan, has collected nine points (3G-6A) in only three contests as his squad earned first place coming out of round-robin competition, advancing directly to Sunday’s championship finale. Steel, captain of the Pats, already has 13 points (2G-11A) to his name through four outings, as the host Pats ousted the Hamilton Bulldogs in semifinal competition in order to book a ticket to last game of the CHL’s 2017-18 season. “It’s the biggest game of our lives,” Steel said. For the Titan, Viel has been a force to be reckoned with. From thundering checks along the boards, timely goals and responsible defensive play, the 21-year-old product of Rimouski, QC has done absolutely everything asked of him – and then some. As an undrafted free agent who signed an American League contract with the San Jose Barracuda earlier this month, there are likely many fans watching the 2018 Mastercard Memorial Cup who came in with little knowledge of Viel’s abilities. While they’ve certainly received an education over the past 10 days, folks out east have long been familiar with how truly dominating the power forward can be. Viel bulldozed his way through the 2018 QMJHL Playoffs, recording 23 points (14G-9A) and 34 penalty minutes over 20 games, earning himself the Guy Lafleur Trophy as MVP of the QMJHL Playoffs. 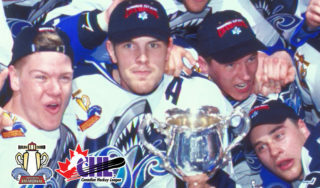 “Winning the President Cup was amazing but I think winning the Memorial Cup would be another level,” Viel said. For the Pats, Steel has taken his game to a new level at the 2018 Mastercard Memorial Cup. With a five-assist performance in Game 6 of the tournament, the 20-year-old product of Sherwood Park, AB shredded the Swift Current Broncos in a 6-5 victory and etched himself in Memorial Cup history, tying a tournament record for assists in a single game. Now, Steel finds himself within firing range of more Mastercard Memorial Cup records. 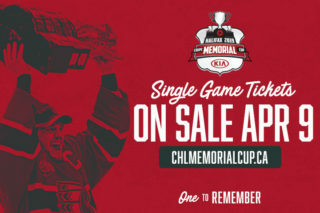 With 13 points (2G-11A) to his name, the prospect of the NHL’s Anaheim Ducks could very well find himself in the company of other Memorial Cup record holders when the buzzer sounds on Sunday. Jeff Larmer of the Kitchener Rangers and Guy Rouleau of the Hull Olympiques collected 16 points in the 1982 and 1986 tournaments, respectively. Dan Hodgson of the Prince Albert Raiders dished out 13 assists during the 1985 Memorial Cup. Both marks are within Steel’s reach, should he continue to produce at the alarming rate witnessed thus far. Having helped Canada win a gold medal at the 2018 IIHF World Junior Championship, Steel has big game experience to draw from. It will not come as a surprise to see the soft-spoken forward find a way to further lock himself into Memorial Cup history. 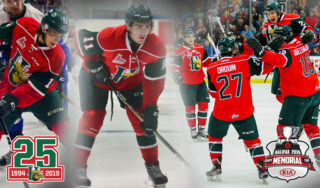 Sunday serves as the final game of the CHL season. There’s a very good chance it will be the final CHL game of Steel’s career, as he is signed and set to join the Ducks system next season. It will also serve as the final CHL game in the career of Viel, an overager. At the end of the night, only one of these players will leave the ice victorious. But rest assured both will give everything they have to give. 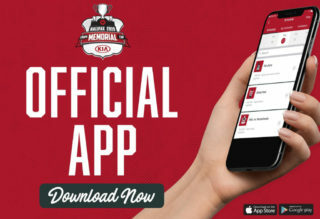 Regardless of who raises the coveted trophy and where life takes them after that moment, Viel and Steel will go down as two of the most respected, hardest-working captains in Memorial Cup history. 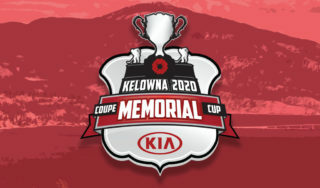 And in the 100th year of Major Junior hockey’s most beautiful competition, one in which ultimate sacrifice is honoured and remembered, there’s nothing more fitting than two ultimate leaders giving every last ounce of sweat for the good of their teammates, their towns and the Memorial Cup. Watch the 100th Mastercard Memorial Cup Final live from coast-to-coast on Sportsnet, TVA Sports and NHL Network at 5pm MT/7pm ET.